Probabilistic hazard risk estimates using Bayesian uncertainty quantification need ensemble methods to explore the parameter space, requiring complex sequences, interactions and exchanges of data and run-time determined computations. In order to make this analysis easier for end researchers to access, a portal based access to the toolkit has been developed. The portal accessible via Volcano Hub makes it accessible to a large number of geologists all over the world. 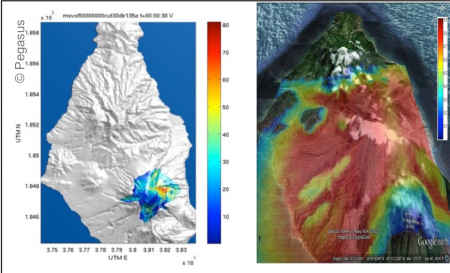 Using this portal, geologists can execute workflows for hazards from volcanic debris avalanches and atmospheric ash transport. The Pegasus Workflow Management System (WMS) in conjunction with HTCondor on the HUBzero.org’s VHUB site, provides the structured platform required for implementing these workflows. 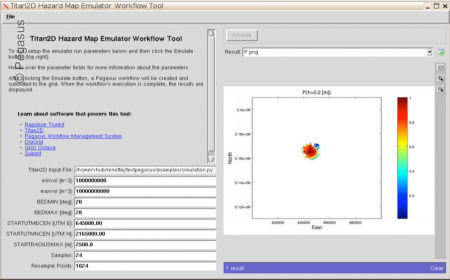 Figure 2 illustrates a single simulation for a volcanic flow, using the Titan2D Hazard Map Workflow tool available on VHUB. Pegasus WMS automates and manages the execution of the jobs required to run the workflows, including, staging the jobs, distributing the work and submitting the jobs to the Center for Computational Research (CCR, UB)’s u2-grid to run on UB-HPC cluster general-compute nodes, as well as handling data flow dependencies and overcoming job failures. 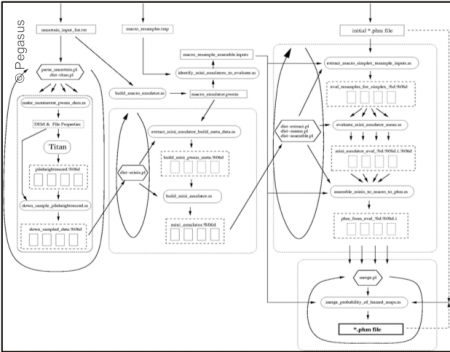 The workflows are described via abstract workflow (DAX) files which are directed acyclic graphs in XML format. Data and software locations are looked up at planning time. A Python DAX generating API is invoked to create the DAX files.